Notes: Based on the ongoing manga by Gosho Aoyama. 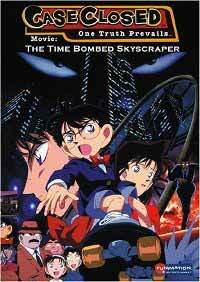 This is the first of (to date) sixteen Detective Conan theatrical films. This review will be using the original Japanese character names; note that the FUNimation dub uses rather different names due to copyright issues here in the States. I had reviewed the second movie some time back, and never got around to covering this one as well, because, well, frankly, this whole franchise and, in fact, the whole Japanese "boy detective" cliche just plain puzzles me. The problem is often that the clues that these deductive geniuses use to solve the murder cases at hand are often not actually revealed to the general public until it's time for the protagonist to reveal them, which gives the astute observer the notion that he's pulled the whole kit and caboodle out of his nether regions. This is a chronic problem with Detective Conan, and what's even more dismaying is that Shinichi's little "shrinkage issue" makes his access to active crime scenes even less realistic to anyone beyond the protagonist's apparent age. I mean, let's think about this: who is going to let any civilian, much less a child, waltz into a bomb scare? Much less the whole raft of them we are presented with in this film? Not to mention that deductive reasoning does not automatically give you the years of explosives disposal training needed to successfully defuse even one of the devices given here, unless, of course, the perpetrator is a complete idiot (which, given that he hasn't managed to blow himself up with any of these things, is an equally unsatisfactory explanation). For all the inherent faults of the series and movie premise, there is still a decent amount of merit to be had with this film. There are some clear benefits to the theatrical format here as opposed to televised episodes; now Conan and Company are not beholden to the constant need for episode cliffhangers, and Time Bombed Skyscraper offers an entire storyline neatly wrapped within its runtime, while not having to deal with nearly the number of suspects as you would find in a TV series story arc. We also get to see teenage Shinichi in action, which is a change of pace from always seeing kid Conan and the Junior Detective League save the day. Oddly, for me, the whole subplot with Shinichi trying to set up a date between his teenage self and Ran without revealing his big secret to her was more compelling and more interesting than the actual mainline plot about the architect and the bombs -- it is very clear that the characters are the linchpin to this franchise's perennial success, rather than the ridiculousness of its plotlines and the wildness of its deductions. And it continues to amuse me how Kappei Yamaguchi (already in his late 30s by the film's release date) manages to still pull off anything resembling a teenager. I've never noticed Minami Takayama miss a note as Conan, either, and I've always had a soft spot for Wakana Yamazaki as Ran (which has very surprisingly little to do with any previous role in Marmalade Boy despite any assumptions to the contrary). Unfortunately, that's about all I've got. The art and animation (from the Late Cretaceous Age of the acetate industry) are starting to look quite dated and were clearly never intended to impress in the first place; the characters (even the adults) remain broad and somewhat juvenile, though at least they're likable and it's not like I ever wanted Shinichi or Ran or Kogoro to get blown up (and obviously they won't, because there wouldn't be another fifteen movies if they'd bought the farm here). If you haven't bought into the franchise by now, neither this film, nor, I suppose, any of its successors is likely to convert you. And that's kind of a shame. It's not like I don't like detective shows - my wife and I have made a habit of watching Psych, of all things - but this kiddified version of the genre simply doesn't work for me, and thanks to the constant threat of violence to young characters, I'd actually feel a little leery of showing it to the very children it was aimed at. Now there's a conundrum I wish Conan could solve for me. Recommended Audience: Though aimed at older children, there is a fair amount of violence, and even a little blood. Nothing that should scare off teens, and supervised viewing with audiences ten and up should still be fine, ultimately, it's best to know what your children can handle and go from there. Not a whiff of fan service, which would be horribly out of place with this franchise.